Manaslu Trekking is for those who are looking for the tough trek along with experiencing most awesome mountains scenery on earth. This trek has been access to this are from 1991 only. Manaslu (8156m) was attempted by Japanese Expeditions every year from 1952 until 1956, also known as "Japanese Mountain". The journey around these legendary mountains is definitely enjoyable and tough one. This trek too offers variation of landscape like starting form lowland to touching almost to Tibet border. Service Excludes: lunch/dinner at Kathmandu, laundry, telephone calls, emergency evacuation if required, donation, tips and all personal nature expenses, sleeping bag. Day 03	Kathmandu - Gorkha (1150m) : After breakfast the early morning drive from Kathmandu to Gorkha is about 6 hours crossing 140 Km. An optional hike can be done to Old Palace of Gorkha, the palace of the King Prithivi Narayan Shah who conquered and unified all small countries to one and named Nepal. Camp is little bit down in very nice rice fields facing Manaslu and Annapurna range. Day 05	Khanchok - Arughat (700m). A descent continues further from Khanchok and you reach the stream, crossing steps made of stone, again climbing up you will come to Koyapani (950 m). After Koyapani it’s abrupt descend to the valley, crossing streams, walking by the bank of rivers and walking through the rice fields and in another hour to Shiraune Bash. We continue our walk overlooking the BuriGandaki later on cross the suspension bridge over the Brui Gandaki and finally come to Arughat Checkpost and have a short rest. Camp a little bit upstream near Kati Bazar alongside the Buri Gandaki river.6 Hours Walk. Day 06	Arughat – Beyond Soti Khola 620 m (Korsanadera). Now during 8 days we are going upstream the Buri Gandaki. Today you will ascent once through the rice paddies and farm fields and pass through small hamlet Kokethar. We come across to huge rock to your left and again walking down will come to cross the Amas Khola, we move again through the rice fields, pass through the forested area. After a while we reach to Kyoropani from here repeating ascents and descents you will be traversing until you come down close to the shores. We keep on moving along the river and soon come to Soti Khola and after Soti Khola walking few ascents & descents with the forested area about an hours away, in the most convenient spot, Korsanadera, we have our camp. 6 hours walk. Day 07	Korsanadera - Maccha Khola (900m). Starting with rocky path, streams with small slope and crossing rice fields we come to the terraced field and Lapbesi (840 m). From Lapbesi we keep on walking farm fields and rice fields again and come to a village, later on the valley begins to widen and we can see Sringi HImal (7087) also known as Chamar far beyond the valley. The path gets down to the shore, after short descent you will reach Kani Gaon, big village with houses scattered. Crossing the village, again the path goes down to the shore and climb back on to the flank. In about an hour we come to sandy bed of Machha Khola. 6 hours walk. Day 08	Maccha Khola – Jagat (1410 m). We leave early in the morning as today’s journey is a long one. The cultivated area ends because the slopes become too steep and the rare remained fields are poor. We walk upstream the river caught between two cliffs till Tatopani, hot springs. The trail climbs up over another ridge then cross the Buri Gandaki on a suspension bridge. Now on the eastern side of the river the trail climbs on a wide well crafted staircase, then across a landslide area over a ridge to Dovan (1000 m), a village that have few small shops. Soon after Dovan cross the Dovan Khola using the suspension bridge and move on repeating ascents and descents. Continue traversing the slope, huge cacti, gaining altitude steadily, the Buri Gandaki here is a torrent that rushes down. We pass the steep ascent, the valley widens and the Buri Gandaki can be seen through the large sandy river shore. We keep on moving with level path, and come to Yaru Khola (1330 m), we cross the 93 m long suspension bridge over Yaru Khola and ascend a wide set of stone stair case, descent to the river and then climb again up more stone stairs to Tharo Bhanjyag. We cross the west bank of the Buri Gandaki, climb a ridge trek along the river and come to the close housed village of Jagat at 1410 m. Jagat has a check post (ACAP) office and few small inns. 8 hours walk. Day 09	Jagat - Philim (1700m). Climb up over the rocky ridge to Salleri (1440 m)and the good view of “Shringi Himal”.is seen as you continue walking the side of the cliff. The trail then descends where several mani walls indicate now the region is entering to the Tibetan influence area, though Gurung are the dwellers around. We come to Ghatta Khola where several mills (Ghatta in Nepali) can be found. We cross the suspension bridge and climb up to the village of Philim, a Gurung village. 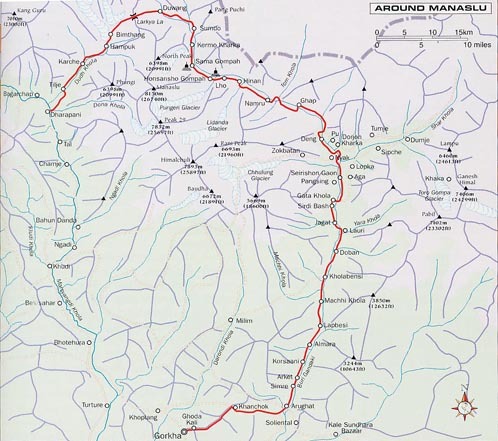 Manaslu Conservation Area Project head quarter office is also in this large village. We camp here for the day. 4 hours walk. Day 10	Philim – Dhing (2050m). The trail ahead turns north just above the lowest house in the village and stays fairly level as it traverses millet fields to Ekle Bhatti (Serson) at 1600 m. there is alternative route to reach Ekle Bhatti, by passing Pangsing, climbing Ngyak village and descent & ascent over another ridge before rejoining the new trial. Now the trail descends, Buri Gandaki soon narrows to 5 meters wide , we cross the bridge , traversing around pine forest on the flank and you will see Shar Khola joining the Buri Gandaki on the opposite bank. We continue moving on repeating the ascents & descents and also with some of the banks of the river. The trail makes its way up the western side and the valley finally widens, offering a nice and pleasant walk through bamboo forests to the Dhing Khola. We cross Dhing Khola and reach Dhing Village where few numbers of houses are only built ,this is the village of Gurung, but it seems to have a strong Tibetan influence. The camp site will be at flat land around the houses. 5.30 hours walk. Day 12	Namrung – Lho (3180 m). The trail enters upper Nupri where Tibetan influences are obvious like wearing dress called Chubas, a Tibetan style wraparound cloak. We climb up many meadows and houses to Barsam village, then through the forests, rhododendrons, the path passes through stone arched, closely built houses of Lihi (2900 m), Lihi has a Gompa on the side of the trail. The trail again goes through a kani and path goes around heading for the Hinan Khol. Cross the Hinan Khola through the bridge, will come across another kani, go through it and you are in Sho Village (2960 m). Now the views open up and Naike Peak, Manalsu North (7157 m) and long waited Manaslu (8163 m) appears at the head of the valley. The trail crosses a small ravine to a big prayers wheel in the middle of the trail. After a while you will be in neighboring village Lho (3180 m), a large village with many houses, with a Gompa, rough stone archway at the entrance and a Tibetan style chorten and huge mani wall at the western end. The spectacular eye catching of view of Manaslu from the kani above Lho is marvelous. We camp for the night here. 4.30 hours walk. Day 13	Lho- Sama Gompa (3500 m), Descent down to the Damonan Khola, cross the wooden bridge near some mills, the start ascending again., you will see the peak 29 ahead of you. The trail heads along the stream and the path will fork into two. We take the trail to Sama via Honsanho Gompa. We cross the stream, forested area and after 3 minutes of ascent, we will reach Honsanho Gompa, the views from here are Manaslu North, Manaslu and peak 29. It takes 2 hours to climb Pungen Galcier, but it is highly recommended to those who are quite physically fit and can challenge this one unless well experienced guide is with you for this trip. Now you will be descending for some time coming to meadows and crossing form one Chorten to another. You will also see many potato fields before reaching Sama Gompa (3500 m). Day 14	Rest day at Sama Gompa: Explore around Sama Gompa like visiting chortens, Gompas and some holy lake. Or as said earlier one can try to Pungen Glacier, again if you are physically fit and determined to accomplish it, also if the guide is quite knowledgeable. It is about 5 to 6 hours circuit. Day 15	Sama Gompa – Samdo (3900 m) After Sama Gompa stay, we walk through flat land, meadows and bushes with some alternation of time. We soon descend by the shore of Buri Gandkai crossing the wooden bridge over the stream that comes from Manaslu Galcier. We even can hike for an hour to reach Manslu Glacier climbing over the stream and if we climb the ridge-like moraine we come up to cliff, overlooking the glacier lake. The amazing view of Manaslu from the glacier lake is magnificent. We enter in the meadows from the path of river shore and you will reach Krmo Kharka, looking up Manaslu right in front of you. Cross the Kharka, descend again to the river shore, cross the wooden bridge and climb up the steep slope to the terrace, go through the kanni, move on for a while and you reach Samdo, nestled behind the ridge at 3900 m. This village has a police check post but the concerned official may be headed to warmer place in winter. 3 hours walk. Day 16	Samdo- Larkya B. C. (4450m). Continue our walk down the gentle flank, cross the wooden bridge over Buri Gandaki and begin walking upward. We cross two streams and witness the Larkya Glacier. We go around the valley of the Salka Khola and climb up again and come to the stone guest house (4450 m) which is not a lodge but a kind of shelter called “Daram Shala”, also, know as Larkya Phedi. We camp here today and have a rest to prepare for tomorrows assault of crossing the famous and most awaited Larkya Pass. 3 hours walk. Day 17	Larkya B. C. - Larkya Pass (5135m) – Bimthang (3800m). It starts with a gentle and long climb from the Dharamsala, looking at Cho Danda in front on the right and Cho Dhana on the left.. Cross a small ridge, cross the side of the glacier lake and descend to the glacier. We gain the height from here climbing the ridge until you reach the top of the moraine at 5135 m. This is the top of the Larkya pass where the color prayer flags are flapping in the wind. The views of Cheo Himal (6820 m), Nemjung (7140 m), Gyaji Kang (7038 m) and Kang Guru (6981 m) are so clear and magnificent. Now the steep down descend starts from the top on the snow covered slope. After passing the scree section and then entering the ablation valley, you will reach Larcia, from here, keep on going down the path on the side of the moraine, andyou will come to Tanbuche (4450m), grassy moraine of small kharka. We continue to make descent from the kharka to the ablation valley, the trail becomes better and easier and heads down to a large meadow a mani walls and small rest house. This is Bimthang (3800 m). 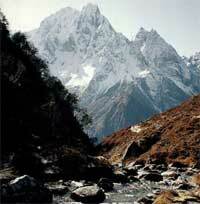 The Panoramic views of West Manalsu face and Phungi (6398 m) are in front of The village. On the opposite side Nemjing stands and looks gorgeous during evening & morning time. 8 hours walk. Day 18	Bimthang - Tilje (2300m). During a few hours we don’t know where to look: the Peri Himal massif, the huge west side Manaslu cirque... amazing! A fairy atmosphere through the forest: rhododendrons, very big trees, branches covered with leaches, glaciers on the background and the Dhudh Khola, an impetuous torrent, we are walking along. Camp in the playground of the Tilje school. 6 hours walk. Day 21	Syange - Besi Sahar (850m). The Marsyandi valley opens and on its banks terrace fields and villages clung very high to the hillsides are the age-old work of the Nepalese farmers. We cross several interesting villages as Bhulbhule, Khudi. Then we walk on a flat part alongside the left bank of the Marsyandi. A last walk up for reaching Besi Sahar, a dusty and busy place which marks the end of our trek and the beginning of the civilization. Last camp around. 4 hours walk. Day 22	Besi Sahar - Dumre - Kathmandu. Our bus to Kathmandu will be waiting for us to take us back, After a about 7 to 8 hours we come to Kathmandu and get a nice room with shower. Day 23	Kathmandu. Morning & Afternoon free, in the evening farewell dinner is arranged. Day 24	Transfer to airport for final departure.